This will undoubtedly be my shortest review. If you’ve played any “beat um up” or Action game – the complexity consisting of choosing to use a light attack or heavy attack, such choice. -- You already played this game. 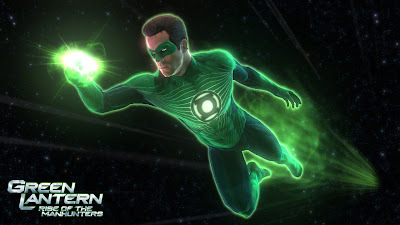 I’m too big of a Green Lantern fan to let the first video game starring the glowing spandex wearing superhero pass me by. I guess this is where I should explain some of the story. Whatever. Manhunters – a race of bounty hunting robots, created by the Guardians of the Universe, before the Green Lantern Corps – have returned to destroy Oa and enforce justice on the galaxy. In the rudest way possible it seems. Hal Jordan, newly minted Green Lantern is ready to bust some robotic heads. Ryan Reynolds lends his voice and likeness to Hal Jordan – mostly yelling out his lines as if the game was designed for the hearing impaired. Still his performance is godly compared to Tobey Maguire’s hackneyed voiceover from Spider-Man 2. If you’re getting paid, at least try to sound sincere. The games average in every sense of the word. The face buttons consist of light and heavy attacks and gasp! You can alternate between them! Dah, dah, dah, dahhhhh! Spectacular, I know. The combat is solid – which is good because you wouldn’t get any satisfaction from solving any of the so-called puzzles that would only challenge a baby still in the womb. If all else fails, use Mace Storm until the credits roll! 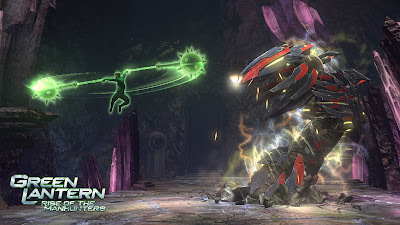 What little depth and uniqueness this game possesses comes from the special attacks or constructs the Green Lantern can create. Create not being the best term to use; as you don’t create them so much as assign them to a face button then input the command and watch the ensuing carnage. The game does get quite fun towards the end –after you’ve upgraded everything – you really feel like a badass; transforming into a giant Mech and stomping enemies, mowing them down with a Gatling gun, or throwing a frickin’ F-16 Fighter Jet in their faces, it’s all very satisfying. As one would expect this is not a long game. Consisting of only ten levels. Three of which are on-rails shooter types akin to Star Fox or Panzer Dragoon, only without most of the fun and not requiring any skill. It’s by no means a hard game at all – the hardest difficulty is a cakewalk even without a co-op buddy to help you. Yeah, if you like a second player can join in on the ring-slinging willpower action. But the lack of challenge as you just chew threw enemies like a plate of hot wings at a tailgate is all too evident. The visuals and sound design are less then noteworthy. Some of the effects are cool. 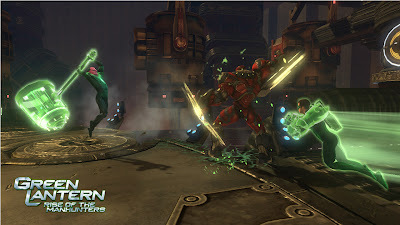 The constructs are intricately designed and the animations are very smooth and fluid. When you’re completely powered the screen just becomes a swarm of green light cascading across the screen, it’s pretty flashy. It would be nice if there were at least some incentive to play through it more then once, considering it’s length. A harder difficulty or a score attack mode would have been nice. Unlocking the classic Green Lantern suit could have been cool. The collectables are minimal as well, most can be found without traveling to far from the beaten path. Finding a collectable in this game is about as close as you’ll come to having to backtrack, while some may like the linearity, a little exploration couldn’t have hurt. That Manhunter was literally hours away from retirement. Green Lantern: Rise of the Manhunters is a forgettable game to say the most. And the movie seems to be along the same lines, as the reviews start pouring in. While I doubt we’ll get another Green Lantern movie –a script for a sequel was being worked on before the first film even finished production, maybe next time you should concentrate on the present, guys – It would be nice to get another Green Lantern game. One the stays true to the creativity that makes Green Lantern so special. For now we have this…meh.